Recorded messages spoken to teddy bears could pose privacy risks for children. A security vulnerability allowed anyone to view personal information, photos and recordings of children’s voices from CloudPets toys. And at one point, some people tried to hold all of that information for ransom. According to a report compiled by security researcher Troy Hunt, over 820,000 user accounts were exposed. That includes 2.2 million voice recordings. “I suspect one of the things that will shock people is that they probably didn’t think through the fact that when you connect the teddy bear, your kids voices are sitting on an Amazon server,” Hunt said. CloudPets toys connect to mobile apps and let parents and loved ones send messages to their children that are played through the stuffed animals. When you create an account with CloudPets, you give it your child’s name, an email address and a photo. Like other toys that connect to the internet, CloudPets stores all that data in the cloud, not on your smartphone itself. The toys launched in 2015, and include stuffed bears, dogs, cats and rabbits. But as Hunt and other investigators found, kids’ information was stored in an insecure database that didn’t require authentication to access it. As Hunt explained to CNNTech, it takes one mistake to expose this data — the error on the database was a bit like not having a pin on your smartphone. This database was indexed by Shodan, which is a search engine for finding insecure devices connected to the internet. You can use it to see if popular devices (like toys) are leaking data — you can also use it to take advantage of insecure systems. According to Hunt, that’s what happened. Someone deleted the data, and posted a ransom note: CloudPets would have to give the bad actors Bitcoin in order to get its data back. Instead, CloudPets likely restored the data from a backup. The data is no longer publicly accessible. But CloudPets has not informed users of the leak, and as far as researchers know, the passwords are still active. This could be a violation of the law. In California, the government requires companies to notify users if their information was exposed online. CloudPets, and its maker Spiral Toys, are based in California. It’s not the first security debacle for internet-connected toys. Hunt also discovered a flaw in VTech gadgets that leaked data on millions of parents and kids, and Germany recently told parents to trash Cayla dolls over hacking potential. Concerned users tipped off Hunt to the CloudPets leak after their emails to the company went unreturned. Hunt worked with reporter Lorenzo Franceschi-Bicchierai of the tech site Motherboard to try and contact CloudPets to report the issue, but was unsuccessful. A CNNTech email to CloudPets was returned as undeliverable. Spiral Toys sent CNNTech a statement addressing a story about the leak reported by Franceschi-Bicchierai. The company said no messages or images were compromised. My battle with acne started in middle school. It’s better than it used to be, and I’m much better at concealing it, but breakouts still happen even in my late 20s. While I’ve tried a lot of products aimed at zapping my zits, and some have worked more successfully than others (salicylic acid face wash, I love you), I’ve never tried to overhaul my diet for better skin. There’s reason to believe that it would help, especially when it comes to dairy. Let me back up for a second. There’s no ironclad consensus among dermatologists that eliminating dairy will magically give you the complexion of a skincare spokesmodel. Some studies have found that skim milk, specifically, might be an acne contributor. (The exact mechanism isn’t clear, but it could be that skim milk increases a hormone that then ramps up oil production in your skin). Other, less conclusive research has found links between acne and any type of milk. Dermatologists who do advise blemish-prone patients to eliminate milk say you should go all in, getting rid of any dairy in your diet. For me, if there was even a chance that it would diminish my acne, I was willing to try. For the sake of my skin, though, I went cold-turkey off dairy for three weeks. Here’s how that went. First, one last pint of cookies and cream ice cream. Then, some research. I have a decent knowledge of nutrition—I can name surprising foods that are full of sugar, and tell you what to eat if you want to add more fiber to your diet. But I’m surprised to see what foods may contain dairy. Salad dressings, granola bars, crackers, bread, deli meats?! I look up no-dairy diet rules online and see butter on some no-no lists, while others say it’s okay. Small amounts of butter are a cooking staple in my apartment, so I decide to allow it (sorry not sorry). My normally delicious cups of tea in the morning are not so delicious without milk. New resolution for tomorrow: Remember to bring something, anything, nondairy to put in my tea. I also realize the no-dairy thing will make it difficult to dine out or eat anything that I don’t prepare or witness being prepared. I normally buy my breakfast in my office building’s cafeteria, and while I’d never wondered if my daily oatmeal was made with milk instead of water, I’m definitely wondering now. I want to ask one of the cafeteria staff, but I also don’t want to be that person who’s asking whether food complies with their totally non-life-threatening, completely self-imposed dietary restrictions. So I don’t ask. Later, I look up the food-service company that runs our cafeteria to see if I can find nutritional information on their website—no such luck. I forget the almond milk again. So, I switch to icing my tea, which tastes slightly better than hot milk-free tea. I decide that instead of trying to swap normal dairy sources for nondairy versions (i.e., vegan cheese. I don’t know what it’s made of and I don’t want to find out), I’ll just change my diet accordingly. Milk-free tea? Okay. Pasta without Parmesan cheese grated on top? No fun, but fine. My fiancé is breading chicken for dinner and I say yes when he asks if he can put just a splash of milk in the egg wash to thin it out. This brings me to one of the complicating factors in this whole restrictive diet thing: My fiancé and I cook and eat dinner together pretty much every night, and this is a guy who never turns down cheese and makes himself a chocolate milk for dessert more nights than not. When I told him that I was doing this story, and that I would understand if he didn’t want to do dairy-free dinners for three weeks with me, I was thrilled when he said he was totally on board. That lasted until about day three, when he decided that he’d support me, but he was done with his own experiment. Today was a long day and when I get home, the last thing I want to do is cook. On nights like this, I’d normally talk my fiancé into ordering pizza (we don’t eat pizza that often! It’s not that bad! Peer pressure!). Since that’s not an option now, I begrudgingly agree that we should make something. I’m happy about the choice—chicken piccata and roasted potatoes—once the food is in my stomach. Let’s talk about my skin: It looks great! Any dermatologist, including Rachel Nazarian, MD, assistant clinical professor of dermatology at Mount Sinai in New York, who I asked to weigh in on whether three dairy-free weeks could really change my complexion, will tell you that it’s not enough time for your diet to affect your skin, especially when it comes to acne. For that, you need about three months (can you say, no thanks?). But I swear I’m noticing differences—fewer new zits, and the one or two I have now are small whiteheads, not the large, deep, cystic kind I usually get. I asked Nazarian what could explain what I’m seeing in the mirror, and she pointed to all of the ice cream I used to eat, for starters. Most ice cream is made with whole milk, so the dairy in it probably isn’t an issue, but ice cream is loaded with sugar, and foods that spike your blood sugar (known as high-glycemic-index foods) are definite contributors to acne. I wonder whether this means that I can never eat ice cream again while admiring the fact that I’m using a lot less concealer in the morning than I was a week and a half ago. My skin still looks awesome but I miss dairy so much. We had Mexican food for dinner last night, and a cheese-less quesadilla is just sad. I’m pretty proud of the fact that I’m relying on healthier foods for snacks, though. Before, I would reach for a bowl of ranch-flavored chips (which contain dairy, by the way) after dinner; now, it’s toasted whole wheat pita with hummus, berries or—gasp—popcorn that I actually made myself on the stove and did not add cheese to. This could also be a reason why I’m noticing skin changes so quickly, said Nazarian. Lots of processed snacks are high on the GI index in addition to containing dairy. I cut them out because of the dairy, but in the process, also got rid of their blood-sugar-spiking effects. I have family coming into town and we always go out for Italian together. I selfishly don’t want to sit there while everyone else enjoys cheesy dishes, so I make reservations at non-Italian restaurants (the benefit of being the one who makes the reservations!). We’re also having them over to watch football at our apartment, and I know they’re going to want me to make our family’s famous buffalo-chicken dip that’s topped with tons of blue cheese. Send me strength. Not only do I not eat the dip, I don’t eat the fried-cheese curds we order from a bar up the street, either. I’ve never been so proud of myself. Word to the wise: If you haven’t eaten dairy in a while, your stomach may stage a full-on rebellion the first time you have some again. It happened to me after dinner last night. As I’ve noticed over these past two-and-a-half weeks, it’s really hard to dine out when you’re dairy free. Even if you think you’re ordering a dairy-free dish, you can’t be sure unless you ask. I ordered a side of crispy Brussels sprouts at dinner. Seemed like a safe bet. They came with a bit of creamy, garlicky sauce on them, even though the menu description said no such thing. I didn’t want to let them go to waste so I had just a few. They were crazy delicious, but about an hour later, even that tiny amount of cream made my stomach revolt on me. Sweet Freedom! I’m so close to being done that I can actually taste the mushroom and pepperoni pizza I’m going to order immediately afterward. But I can’t ignore the fact that my acne is better than it was three weeks ago, particularly now, at a time of the month when my jawline would normally be dotted with breakouts (thanks, hormones). I’m getting married in the fall and based on the results I saw after three weeks, I’m considering going dairy-free for the three months leading up to the main event. I don’t think I’ll stay 100 percent dairy-free in the meantime, though—it makes it really hard to dine out, and even though I don’t eat out that often, I don’t need it to be a stressful process when I do—but I am going to stick with my dairy-free, healthier snacks. And yes, I’ll even cut back on the ice cream. Fancy cars and high-end shops are probably not a way to reach your savings goals. When you’re so good at saving money that you can retire at age 31, people understandably want to hear your money tips. That’s how Clark Howard ended up with his own radio show, where he takes consumers’ questions about all things personal finance. As it often is, debt has been a popular topic recently, and Howard has a few tried-and-true tips he likes to share with consumers. Whether you’re committed to paying down huge credit card balances or simply want to avoid ending up in debt, here are three things Howard recommends you do. Saving money is Howard’s primary approach to getting out of debt. Shoot for a savings rate of a dime per dollar earned (or 10%), but if you’re not saving anything right now, start by setting aside a penny per dollar (1%) and increase your savings rate every six months, he said. Unless you can find a way to make more money, that means you need to cut things from your budget and put that extra money toward your debt (or a savings account, so you don’t have to turn to a credit card in an emergency). “A lot of people pay the minimum payment because that’s what the bill says,” said Alex Sadler, managing editor of Clark.com. Doing that could leave you in debt for a very long time, so make it a priority to budget for more than the monthly payment. Credit card bills also include a section that says how much you need to pay each month in order to get out of debt in 36 months (three years), which can help you figure out how much room you need to make in your budget to get out of debt. When you have multiple debts to pay off, Howard recommends using the “laddering method” to save the most money. That means focusing on the debt with the highest interest rate first. It helps to make a list of all your debts and their interest rates. In fact, most people who call Howard don’t know how much debt they have, so sitting down and getting a sense of the numbers is a great place to start. “If you ever want to get out of debt … the first thing you have to do is figure out how much debt you owe, and then you can make a plan,” Sadler said. Though he’s talking about education, that approach applies to anything that could put you in debt. You can’t always avoid going into debt, but if you save up as much as you can and opt for more affordable things (like a vehicle with fewer options or a home with most but not all of the things on your wish list), you’ll end up borrowing less and spending less money on interest. The 2017 Oscars red carpet was star-studded, sparkly and as always, dripping in high fashion. While we would have been perfectly happy to give Taraji P. Henson all of the top spots for best-dressed on the red carpet, there were plenty other equally beautiful looks to swoon over. Janelle Monae took a risk in Elie Saab that paid off tenfold, while Jessica Biel stunned in a golden, Oscar statuesque KaufmanFranco. Take a look at the rest of our picks for best-dressed below (in no particular order). And make sure to scroll all the way to the bottom to see ALL the looks from the night. You know what they say: After the show, it’s the time for everyone to change into yet another fabulous look. At least when it comes to the Oscars, anyway. Sunday night’s red carpet was full of elegance, sparkle, and golden gowns, but the after-party looks were hipper, cooler, and a lot more risky. Stars arrived at the Vanity Fair Oscar Party sporting dancing shoes, plunging necklines, thigh-high slits, more ACLU ribbons and even one wild bathing suit/dress hybrid. It’s almost like the Oscars gowns won, but then everyone realized that the after-party gowns were the real winners. Sound familiar? Check out all of the gorgeous second looks of the night below. A sign outside a second hand shop on New York’s Lower East Side in 1955. Past pollution still having an economic impactThe east sides of New York, London and Paris are noticeably and famously poorer than their western sides. And it turns out there’s a reason for that. Researchers have found that it’s due to the impact of air pollutants at the time of the Industrial Revolution, as prevailing winds in the U.S. and Europe typically blow from west to east. And it’s an impact that has lasted into today. A paper from the Spatial Economics Research Centre examined 5,000 industrial chimneys in 70 English cities in 1880, and then re-created the spatial distribution of pollution. That historical pollution explained up to 15% of within-city deprivation in 1881. “A pollution differential equivalent to the one between the 10% and 90% most polluted neighborhoods of Manchester would be associated with a gradient of 18 percentage points in the share of low-skilled workers,” the paper found. Perhaps more incredibly, that difference has continued to this day even though the pollution that caused them has waned. “Past pollution explains up to 20% of the observed neighborhood segregation whether captured by the shares of blue collar workers and employees, house prices or official deprivation indices,” the paper written by Stephan Heblich and Yanos Zylbergerg of the University of Bristol and Alex Trew of the University of St. Andrews found. The researchers say the findings have practical implications both in the developing and developed world. The success of urban policies to revitalize deprived areas depends on their position relative to the tipping point. For countries like China where pollution is a current challenge, there also are long-run consequences to consider, they added. Pedestrians walk in Manhattan on an unseasonably warm February afternoon. (CNN) It’s 60 degrees at 8 a.m., and it already feels too hot for jeans. The birds are chirping, the flowers are blooming, there is a noticeable layer of pollen on cars — and it’s still February! 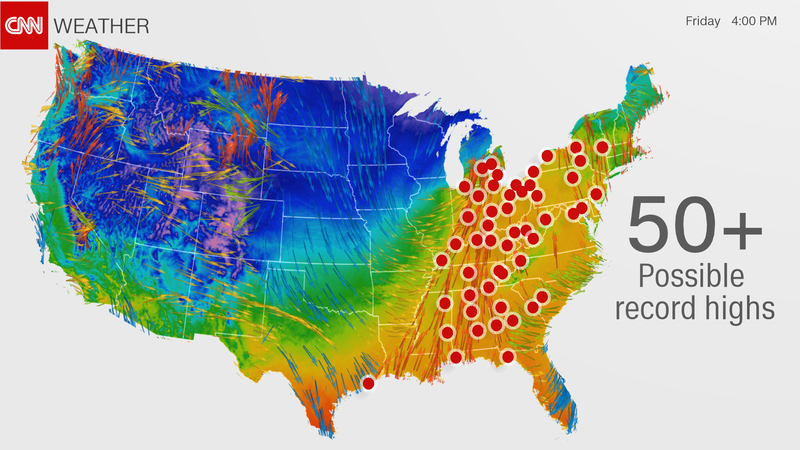 This month continues to defy the calendar, with over 4,400 record highs stretching from the northern US border to the south since February 1. In that same timeframe, only 29 record lows have been recorded. The trees are responding accordingly — to the weather, that is, not the calendar — and are producing leaves as far north as The District of Columbia. 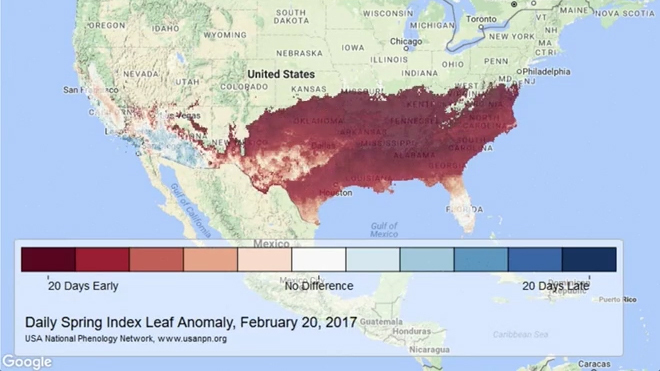 According to the USA National Phenology Network, spring is arriving a full three weeks early. Call it Februmarch. Severe storms in the Midwest and Ohio Valley normally do not occur until March or April. In fact, the National Weather Service in Detroit has never issued a tornado warning in the month of February. 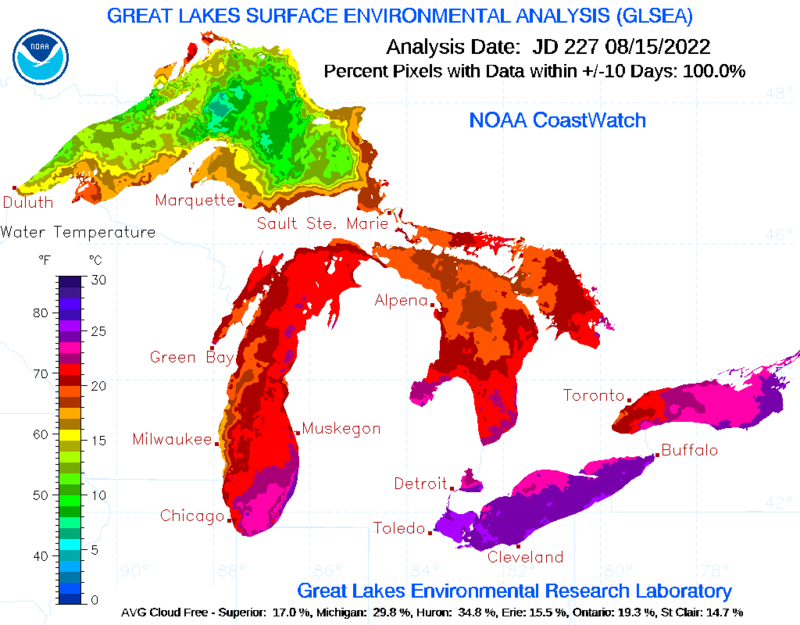 February would normally feature a snowy landscape and the Great Lakes covered with abundant ice. But not this year. As of Wednesday, 0% of the Midwest had snow cover, and only 7% of the Great Lakes featured ice (normal for the date would be about 40%). The heat of “Februmarch” will peak across the eastern half of the country on Friday, as southerly winds ahead of the storm system moving across the Great Lakes pull up warm, moist air from the Gulf of Mexico. According to Ryan Maue, a meteorologist with WeatherBell Analytics, high temperature records will be set Friday from Tallahassee, Florida, all the way up to Flint, Michigan. Record high temperatures at every long-period (100 yr+) station from Tallahassee to Flint on Friday. Perfect day to call in sick. A cold front will push across the eastern portion of the country on Saturday and bring the temperatures back to seasonal norms for the rest of the weekend, but spring-like weather will return next week. Via: What happened to winter?